bundle prints in the hair. grey, sorrel, dyed and so on, and various size : mainly 6- 36"
, 36" up we can supply also. We can supply single drawn and double drawn. Posted By: Anping JuLong Animal By Product Co.,Ltd. 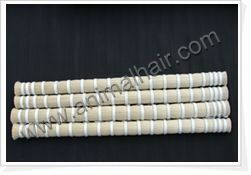 tail hair, goat hair, animal fine hair and horsehair fabrics. Anping County has a history of more than 400 years in bristle and animal tail hair process. It is the biggest distribution center of animal tail hair in North China. There are more than 1000 workshops and over 50,000 people involved in animal tail hair process. The annual export amount of animal tail hair products of Anping accounts for 40 percent of China and 70 percent of Hebei Province. Anping JuLong Animal By Product Co.,Ltd. has seven processing plants. Our horse tail hair and other animal hair products are mainly exported to USA, Italy, Japan, South Korea total about 20 countries and regions and are well received for superior quality and competitive price.